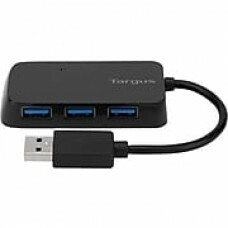 The Targus® black 4-port USB 3.0 hub works well with Windows XP™, Windows Vista, Windows 2000, Windows 7, Windows 8 and Mac OS 10.3.9 and above operating systems. This hub effectively turns 1 USB port into 4 USB ports, which enables you to connect USB enabled devices to your computer or laptop. This USB hub transfers data at blazing speeds and is up to 10 times faster than USB 2.0. The over current protection feature of this USB powered hub prevents from short circuits and electrical current overload.